Cool winter days with bright blue skies and a gentle breeze remind me that spring will make its arrival soon. There is excitement in the air as the MTB season continues its wave of races and events across the country. 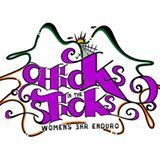 “Chicks in the Sticks” is an all-female event designed to encourage participation in a friendly and festive atmosphere. 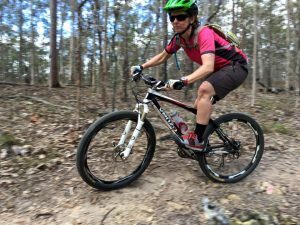 I BRAVELY participated last year – it was my first ever MTB event and I surprised lots of people around me by actually having a go! I’m pretty much a scaredy cat on my bike and so this was a really big deal for me – I actually voluntarily registered, paid for and participated in an event with nearly a couple of hundred other people riding repeats of a 6.5 km loop for 3 hours. I actually did it! And although I didn’t get bitten by the “race bug”, I also didn’t want it to stop there. I wanted to learn from my experience by having another go this year and hopefully feel more at ease with the whole scenario. So earlier this year I enthusiastically registered shortly after bookings opened up for Chicks in the Sticks. I had every intention of training even better than last year. However ….. life happened! In fact, a lot of life has happened over the past few months and I find myself now only 5 days away from the actual event with basically no preparation, less riding than normal, and still fighting off influenza. Cough, cough. My family, work and community life over the past months has resembled a chaotic mix of medical diagnoses, surgeries, recoveries, visitors (these were the good bits! ), sickness, more sickness, drought, broken bikes, short days, frosty mornings, unexpected work commitments, additional family commitments and now influenza! You name it, it seems to have happened in my family in the past few months and limited my capacity to train. As this event has loomed closer and closer, I’ve definitely had those “couldn’t be bothered” and “I’m not good enough” thoughts that only serve to make me feel bad. They don’t change the reality, the things I don’t have control over. Giving in to those thoughts doesn’t change my sense of commitment or my intention. The world hasn’t had a conspiracy against me giving my best shot at Chicks in the Sticks. At times I’ve believed it! But no, there is more to it than that. I’m not actually the centre of the universe. No body has pressured me to do this. The rules about training and preparation and participation are all my own invisible creations that only fit in the world of my inner thoughts, not in the real world where family, friends and health are the priority. So I will bravely make my way round as many laps as I can on Sunday. 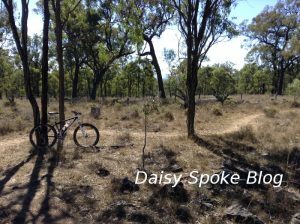 Every pedal stroke will be a testament to living as true to my values as I’ve been able to in recent times – in the same way that my messy house reflects my attention has been directed towards my family members instead of the material side of life. Against all odds, I’ll be at Chicks in the Sticks this weekend. My support team, including my own inner-compassionate-self, will be there too, reminding me of my intention to foster an element of fun and playfulness as I ride with up to a couple of hundred other chicks! What a blast!